The real value behind any pair of compact binoculars is their ability to produce aberration-free, sharp, bright images of viewed objects, which can be fully appreciated and seen from a great distance but only when the binoculars optical systems have been focused correctly. As a beginner, you may not know how to focus binoculars. This can be a complicated process because the binoculars must be adjusted for abnormalities that can exist in a specific viewer’s eyesight. Around eighty percent of people who regularly use binoculars don’t know how to focus them correctly. If you’re new to binoculars, you may want to search for models that are more beginner-friendly and easy to adjust, such as the Eschenbach Trophy compact binoculars. But without properly focusing the binoculars, even the best model will not have an advantage over the worst. Our following tips will help you learn how to get the most out of your new binoculars. Interpupillary distance is the distance between the pupils of the eyes. IPD can vary greatly, ranging from fifty-five millimeters up to seventy-five millimeters. The average distance is around sixty-six millimeters. To focus the eyepieces, begin by holding the binoculars in the standard viewing position. While holding the barrels with your hands, begin to move them farther apart or closer together until the images form a single circular FOV or field of view. With practice, you’ll be able to automatically adjust this setting in a few seconds. Most modern models allow you to adjust the height of the eyecups. Adjusting this feature serves a couple of purposes, including positioning the eye pupils the right distance from the eyepieces and excluding sidelight. Twist-up, pop-up, and rubber roll-down eyecups are some of the commonly used styles. Usually, the eyecups should remain in the up position for people who don’t wear glasses and placed in a down position for people who do. However, the eyecups can be placed in any position, based on user preference. Fixed focus: The lenses are permanently pre-focused for a specific viewing distance. Individual focus: Each eyepiece is focused separately. Center focus: This focus system has a diopter adjustment. By far, the center focus style is the most common. You’ll usually find a separate diopter adjustment that works to compensate for the unequal vision that can occur between the user’s two eyes. This adjustment will feature a scale with a minus and plus sign. The diopter settings that are on opposite sides of a zero marker can involve a focusing ring that’s placed on the right eyepiece, or it can be part of the central focusing system but will remain as a separate function. A diopter in this position can only adjust the right optical system. Yet, with some models the diopter setting is found on the eyepiece on the left, so you can adjust the left eyepiece. You can use your hand, or a lens cover to cover the front lens on the side of the binoculars that don’t have the diopter setting. Next, use the center focus wheel to focus the side without the diopter on a distant object. While making sure to avoid changing the center focus wheel setting, on the diopter side, uncover the objective lens and cover the opposite lens. Focus on the same object in the distance using your other eye. Using the diopter continue focusing on the same distant object until fine details are clear. Now, the view should be crystal-clear in both lenses. If it isn’t, you’ll need to repeat the process again, or until you’re able to enjoy a clear view out of both lenses. Once the adjustments have been made properly, you’ll be able to focus on distant targets simply by turning the focus wheel. With a little practice adjusting the diopter setting will feel like second nature. Individual focus binoculars have been the military’s optical system of choice, mainly because these binoculars are simple to use, rugged, and imperious to atmospheric contaminants, dust, and water. This focusing system allows each of the optical systems to be adjusted separately. This is done by rotating the diopter adjustments which are found on both eyepieces. When the user is viewing objects at different distances this can be a hassle. Basically, the focusing process is the same as that for the diopter adjustment on center focus models. However, it must be done for each barrel. Users of this style will refocus the binoculars only when it’s necessary or in order to adjust them for long or intermediate ranges, while experienced users of center focus models often refocus the binoculars continually. A pair of fixed focus binoculars will not have any type of focusing system. The optics in these binoculars are fixed permanently by the manufacturer and designed for people who have twenty-twenty vision. While obviously these binoculars aren’t designed for everyone, they work well for people who are wearing contact lenses or glasses or younger people who have normal vision in both eyes. Some people who use fixed focus models believe that they automatically focus. However, it’s the focusing ability of the user’s eyes that causes the distant objects to appear sharp. Based on your vision and your viewing needs, you should be able to choose the right type of focusing system that can provide the best viewing experience for you. 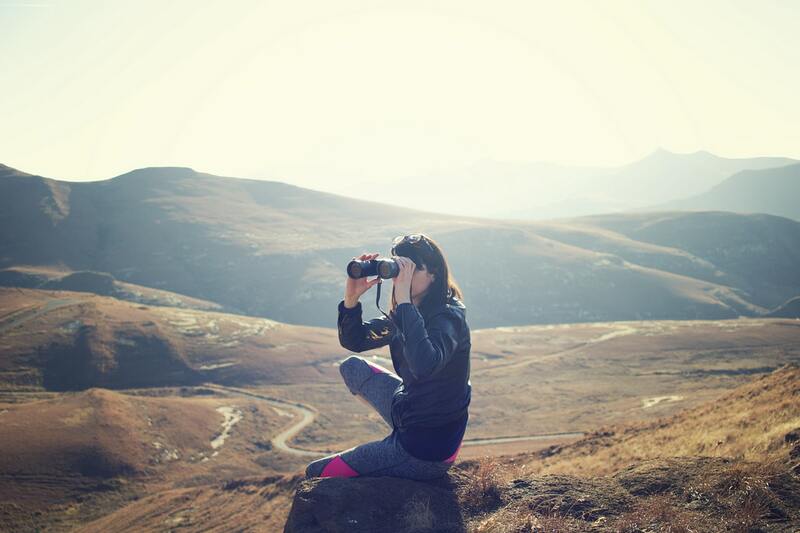 If you’re totally new to binocular use, you may want to choose a pair that’s simple to adjust and easy to care for. If you’re not sure which focusing system is right for you, you learn more information in our buying guide. The process of focusing binoculars varies depending on the type of focusing system the binoculars use. While some styles of binoculars are easier to adjust than others, all of these systems are easy to adjust once you become familiar with the process. If you’re still not sure you have your binoculars focused correctly, you can visit a local camera store, which usually sells and services binoculars as well. While they’re teaching you how to focus your binoculars they can also go over how to clean binoculars, so you can ensure your binoculars remain in excellent condition and can provide the type of crystal-clear viewing experience they’re designed to.